This Audio Visual Cart has Mobile Caster Wheels. The Sleek Black Finish is Certain to Suit Any Environment. This Audio Visual Cart has Rack Mount Storage. This audio visual cart that includes interior storage has 9RU of threaded rack rails to firmly hold media equipment. The interior compartment has a locking tempered glass door to keep items secure. 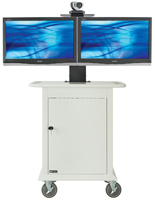 This deluxe TV stand, audio visual cart that comes with a 6 outlet power strip is the ideal podium for video conference devices. The height adjustable camera mount provides the ideal view for virtual meetings. 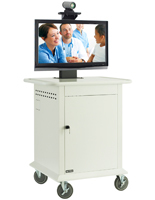 This audio visual cart that has 4 wheels includes two locking casters for stability while in use. The casters are 5" in diameter and easy to move even with all of the equipment installed. Each audio visual cart has rear access to the equipment with hinged and locking doors. Adjustable handles provide ease of movement by giving users a place to hold while pushing or pulling the stand. 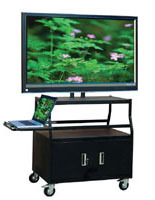 This audio visual cart is durable and designed to last. 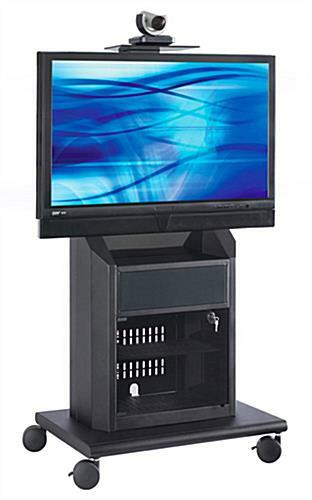 The stand is 60-1/2 inches high for ideal visibility of the flat screen. 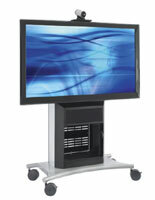 This audio visual cart is sleek and modern to suit high tech conferences. 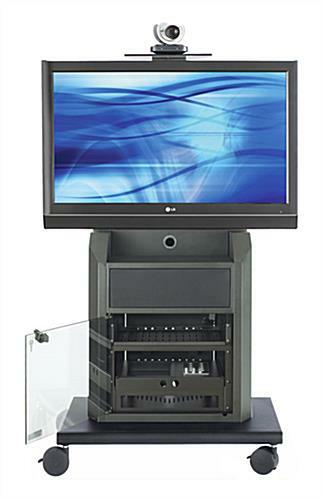 This executive level media rack has more features than most comparable models currently on the market! 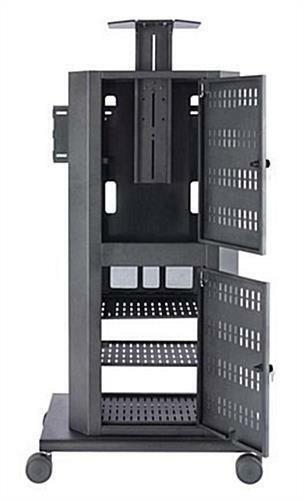 This small footprint audio visual cart, also known as an LCD holder, is equipped with a universal VESA bracket. The wheel base is only 33-1/2"w x 23-1/2"d to save space. 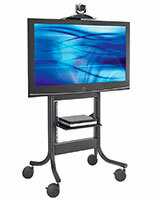 This mobile audio visual cart is ideal for establishments who require high maneuverability of their TV presentations. 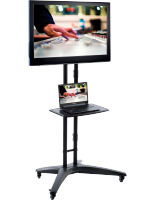 Video conferencing has never been easier than with this AV equipment stand. Expensive media devices are secure in the locking cabinet. The rack rails are the standard 19" width. By installing devices onto the rack mount, equipment stays in place even when the stand is being moved. The rear panels have 2 single gang knockouts in the case that equipment is going to be plugged directly into a wall outlet. Manufacturer model# RPS-800S. 33.5" x 60.5" x 23.5"